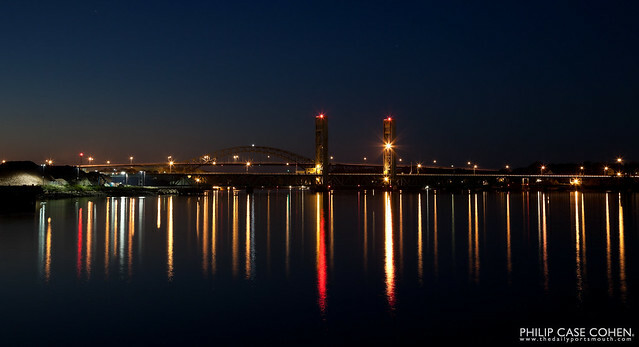 From a distance, a night on the waterfront in Portsmouth seems tranquil and inviting. 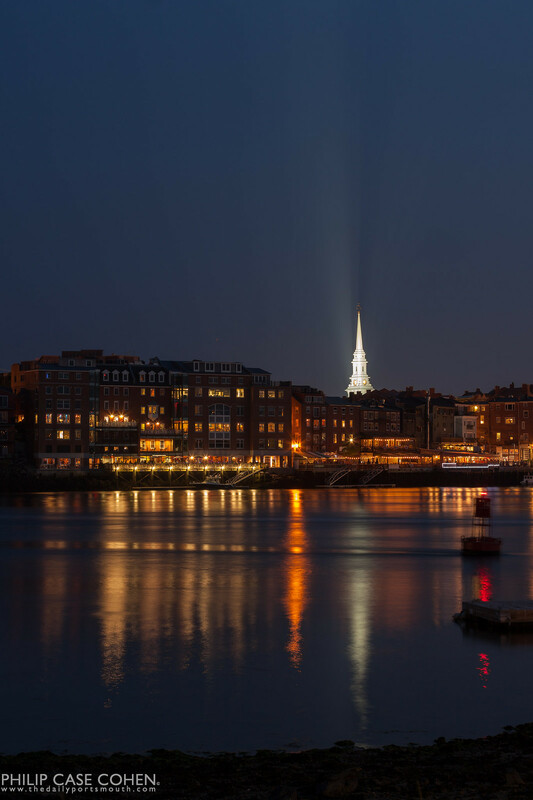 This same scene from the decks themselves reveals a busy and vibrant night life, where it’s normal to have to wait for a table – but it’s usually all worth it if you can time it perfectly and enjoy a summer sunset out over the Piscataqua River on a warm night. One of the best places to go for a walk in Portsmouth is at Prescott Park. The park provides so many opportunities to enjoy beautiful and industrial waterfront scenes all year long, and lush gardens in the warmer months. I decided to head over to Four Tree Island late one afternoon for sunset, but didn’t find much in the way of color or intrigue in the sky – so I focused instead on the beauty of this classic New England scene – complete with a commercial fishing fleet a steeple, and The Player’s Ring. Another freighter has arrived to unload windmill blades at the State Pier. After a delicious meal downtown, Steph and I decided to wander down to the new deck of the Martingale to enjoy an unobstructed view of the waterfront. The swift moving tide made for some interesting longer exposures alongside the orange glow of the alley on Ceres Street and the blasting light of the freighter on the horizon. I like how the cranes are nuzzled against one another from this vantage point and the cranes of the freighter are in opposite directions, and then the abutments of the Middle Bridge stand tall in the distance. 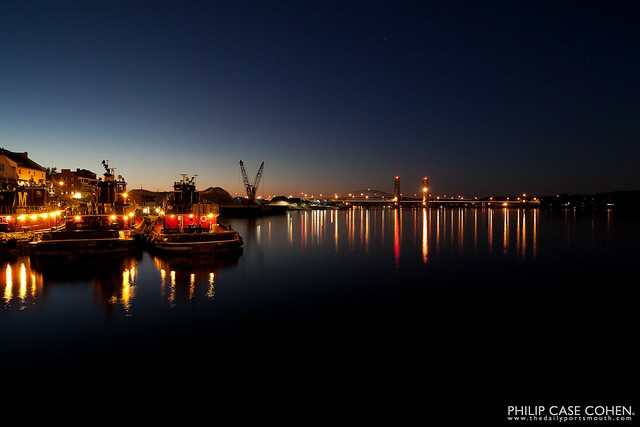 Everything comes in pairs in this one – the tugboats, the cranes, the freighter cranes, the abutments, and the photographer. One of the benefits of living in a large town with the benefits of a small city, is a nice dimly light downtown. I don’t mean dimly lit in a dangerous or scary way, there are plenty of street lamps illuminating sidewalks and streets, but I mean dimly lit as in there is no Times Square/ridiculously lit areas. 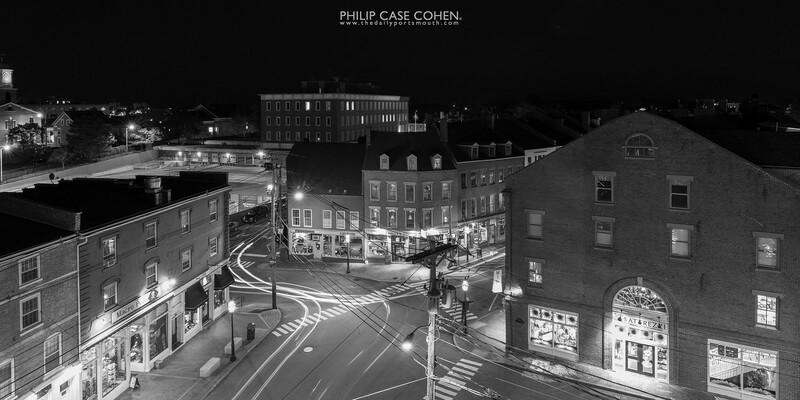 Market Square, arguably the busiest intersection in all of Portsmouth, still has a cozy and intimate feeling at night. I hate the yellow street lamps, it doesn’t make for great photographs, but it definitely makes for a distinctive feel. 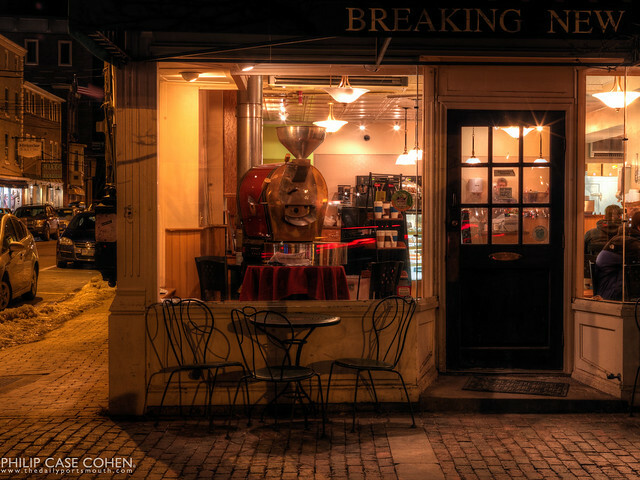 Here the warmth of the interior of Breaking New Grounds spills out onto the brick patio of Market Square. This shot also marks the first over the next few days that will be taken on a Hasselblad that I’ll be demoing. I received the H4D-31 (a 31-megapixel medium format digital camera)….a beautifully solid piece of machinery that captures a higher dynamic range on a larger sensor than my usual Canon 5d Mark II. I can’t wait to get it out for some real hands-on shooting.